Rupee's near-continuous slide against the dollar has been unrelenting. 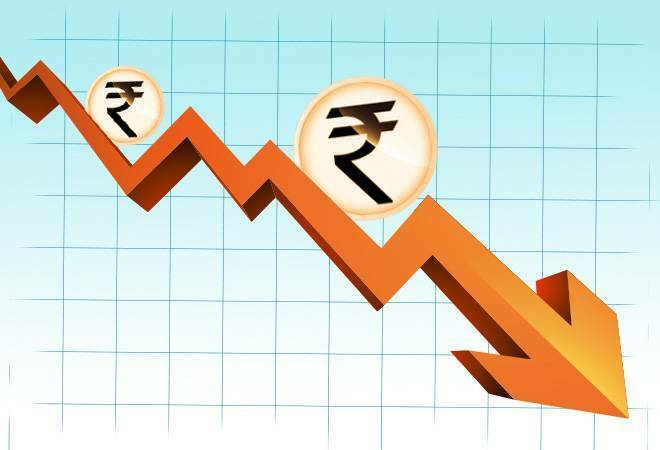 The rupee crumbled by a staggering 37 paise to end at a fresh lifetime low of 71.58 against the resurgent dollar Tuesday as persistent trade worries and macro concerns continue to proliferate. The rupee stretched its record fall for the fifth-straight session even as the RBI remained mostly on the sidelines, currency market participants said. The rupee opened lower at 71.24 from the previous close of 71.21 at the inter-bank foreign exchange (forex) market. Showing some initial resistant to the hardening dollar upsurge, the local unit bounced back to hit a session high of 71.09 briefly before resuming its downtrend. After witnessing wide swings, it finally ended at its historic low level of 71.58, revealing a sharp loss of 37 paise or 0.52 per cent. The domestic currency has been under pressure in recent past with deluge of headlines covering from a range of fundamental concerns against the grim backdrop of surging global crude prices and sustained capital outflows. The ballooning of crude prices has significantly increased the country's oil import bill and it can also lead to a worsening of the current account deficit and fiscal deficit for the domestic economy. Benchmark Brent crude oil traded at USD 79.26 a barrel in early Asian trade. Fuel prices in the country touched new highs Tuesday due to the twin impact of a free-fall in local currency and firming crude oil prices, fanning fear about a spike in inflation. The government, however, said the currency will stabilise on its own as there were no domestic factors contributing to this depreciation. "Rupee has depreciated primarily on trade war fears and rise in global crude oil prices. The government does not have control over these...so there is only so much we can do," a top finance ministry official said. Globally, the US dollar surged against developed and emerging-market currencies over an escalating trade conflict between the US, China and Canada. Emerging market currencies such as the Argentine peso, Turkish lira, South African rand, Brazilian real, Indonesian rupiah and Indian rupee sank as investors fear these export-oriented economies will be caught in the escalating trade war. Against a basket of other currencies, the dollar index was up at 95.44. Investors were also nervous after the US President Donald Trump said he wanted to impose new tariffs on more Chinese goods by this weekend. Local stocks also plunged for the fifth day in a row due to multiple factors like rising crude prices, tumbling rupee and ongoing global trade tiff. The bond yield curve also shot- up substantially to hit a fresh four-year high of 8.06 per cent. The Indian rupee has been among the worst performing currencies in the region, attributed to its current account deficit and mayhem in emerging markets caused by the Turkish lira and Argentina crisis amid contagion fears. Hardening global yields have spurred global funds to pull out from stocks and bonds markets this year and adopted a cautious stance towards India. Foreign investors and funds have pulled out USD 280 million from the Indian equity markets so far this year. Meanwhile, Indian exporters are facing uncertainty due to a continuous depreciation of the rupee as they are not able to negotiate properly prices of goods in the global markets and also unable to hedge due to currencies sharp volatility. In the cross-currency trade, the rupee also slumped against the Japanese yen to finish at 64.34 per 100 yens from 64.10 and also pulled back against the British pound to close at 91.77 per pound compared to 91.65 earlier. It, however, held steady against the euro at 82.72. The Financial Benchmarks India private limited (FBIL), meanwhile, fixed the reference rate for the dollar at 71.1857 and for the euro at 82.4919. In the forward market today, the benchmark six-month forward premium payable in January 2019 and the far-forward July contract was quoted at 120.50-122.50 paise and 269.50-271.50 paise, respectively. A weaker rupee has resulted in rise in import bills, costlier foreign education and travel. The biggest impact is on petrol and diesel prices which have witnessed steady increase throughout the year. The rupee hasn't crashed as much as Turkish Lira or Argentine Peso did versus the greenback. These currencies depreciated over 70 per cent so far this year, while rupee shed 10 per cent, and is comparable to the currencies of Indonesia, South Africa and Brazil.